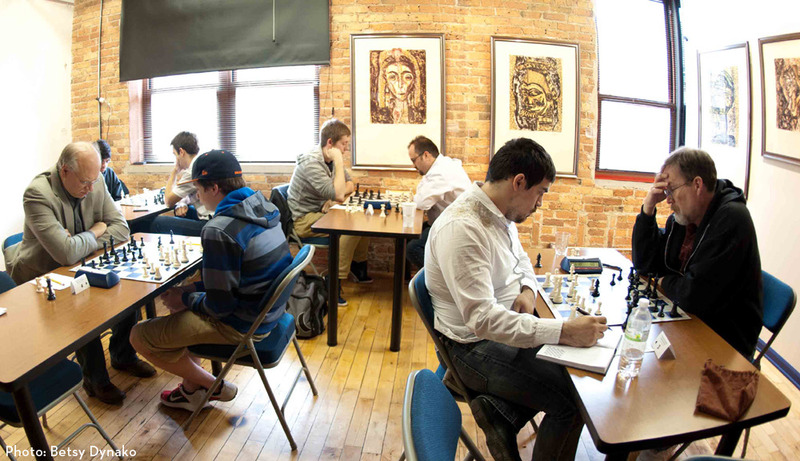 On May 11 and 12, Chicago Chess Center Founders' Court donors were invited to a preview event at which they got the opportunity to square off against local masters and junior experts. The two-day, four-round schedule was chosen to showcase a format that we've considered offering as a seasonal open tournament. The verdict? FM Carl Boor, one of the titled players in attendance, called it a weekend of "fun . . . full-blooded chess every game"! Three of our founding members took part in the tournament: Vince Hart, Dante Silguero and James Hulsizer. 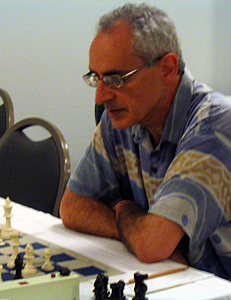 Hart got to play against FM Eric Rosen and NM Danyul Lawrence, Silguero faced Rosen and expert player Michael Auger, and Hulsizer played expert Akshay Indusekar. We're aware that several of our Founders' Court members had looked forward to playing this weekend but were unable to because of other commitments, so mark your calendars now: Our next preview event will be held Saturday, June 29. More details coming soon! The purpose behind the CCC UNAM Invitational was to give our founding members and local titled players (and future titled players) a first taste of what the Chicago Chess Center will offer when we're up and running . . . and we still have a ways to go before we get there. We're more than a quarter of the way to our $30,000 startup fundraising goal -- which means we have nearly three-fourths of the way left to go! To open our doors by fall 2013, we need the immediate support of people like you. Please give now to help us bring the joys and benefits of chess to all Chicagoans. If you're not a Chicago Chess Center Founders' Court member yet, it's not too late! Anyone interested in participating in our first preview event, the CCC UNAM Invitational, May 11 and 12, may donate at the Founders' Court level ($250 or more) right up to the day of the event. We still need your help to open our doors and begin offering events to the Chicagoland chess-playing public in our own space. Please give generously and become a founding member of this important new civic, educational and recreational institution. This exclusive event open only to masters, junior experts and CCC Founders' Court members will have a time control of G/75 plus 30-second increment, with rounds beginning at 10 AM and 2:30 PM each day. Entry is just $15 for CCC members, and we're giving out a guaranteed $600 in prizes (five place prizes of $250, $150, $100, $60 and $40). Nonmember masters and junior experts are eligible to participate for an entry fee of $25. Sets and duplicate scoresheets will be provided; we appreciate your helping us out by bringing your own clock. FIDE Master Carl Boor and junior experts Michael Auger and Akshay Indusekar will be in attendance. UNAM Chicago is at 350 W. Erie St. in River North. Off-street parking will be available for $5 per day in the lot on the northeast corner of Erie and Orleans streets. UNAM Chicago is also an easy five-minute walk from the CTA's Chicago/Franklin Brown Line 'L' station. RSVP by May 8 to info@chichess.org or through our contact page, or send entries by mail to Chicago Chess Center NFP Inc., c/o William Brock, 230 W. Monroe St., Suite 330, Chicago, IL 60606. On-site registration will be open Saturday morning between 9 and 9:45. We hope to see you there! What have we been up to these past couple of months? Planning our first tournament! Thanks to our friends at the Universidad Nacional Autónoma de México's Chicago campus, we're able to offer our Founders' Court members a sample of the kind of events we plan to hold. On Saturday and Sunday, May 11 and 12, we're holding the Chicago Chess Center UNAM Invitational, an exclusive event open to masters, junior experts and Founders' Court members. This USCF-rated, two-day, four-round Swiss will have a time control of G/75 plus 30-second increment, with rounds beginning at 10 AM and 2:30 PM each day. Entry is $25, $15 for CCC members, and we're giving out a guaranteed $600 in prizes (five place prizes of $250, $150, $100, $60 and $40). Sets and duplicate scoresheets will be provided; someday we'll be able to provide clocks as well, but for now we ask you to bring your own. UNAM Chicago is at 350 W. Erie St. in River North (map). Off-street parking will be available for $5 per day in the lot on the northeast corner of Erie and Orleans streets. UNAM Chicago is also an easy five-minute walk from the CTA's Chicago/Franklin Brown Line 'L' station. If you're not a master or junior expert and would like to participate, it's not too late to join our Founders' Court! Any interested player may donate at the Founders' Court level ($250 or more) right up to the day of the event. Remember, we still need your help to open our doors and begin offering events to the Chicagoland chess-playing public in our own space. Please give generously and become a founding member of this new civic, educational and recreational institution. P.S. As a bonus, we plan to hold a thank-you reception for our Founders' Court members around the time of the tournament; details coming soon. And for everyone else, be on the lookout for another Chicago Chess Center preview tournament -- open to all -- this June!